Once I got to editing, cacti and other pointy things just went mad in my pointy brain! So here are some more square yet pointy, spiky, jagged pictures … and keep them away from your eyes! You could put your eye out with one of those pointy things! I don’t even know what these are. Maybe the edges of young ironwood tree? Cactus! Let’s not always see the same hands! Those are some amazing barbs, too. You get close to these and they hop right on to your pants legs. These are jumpers! Not only spiky squares. 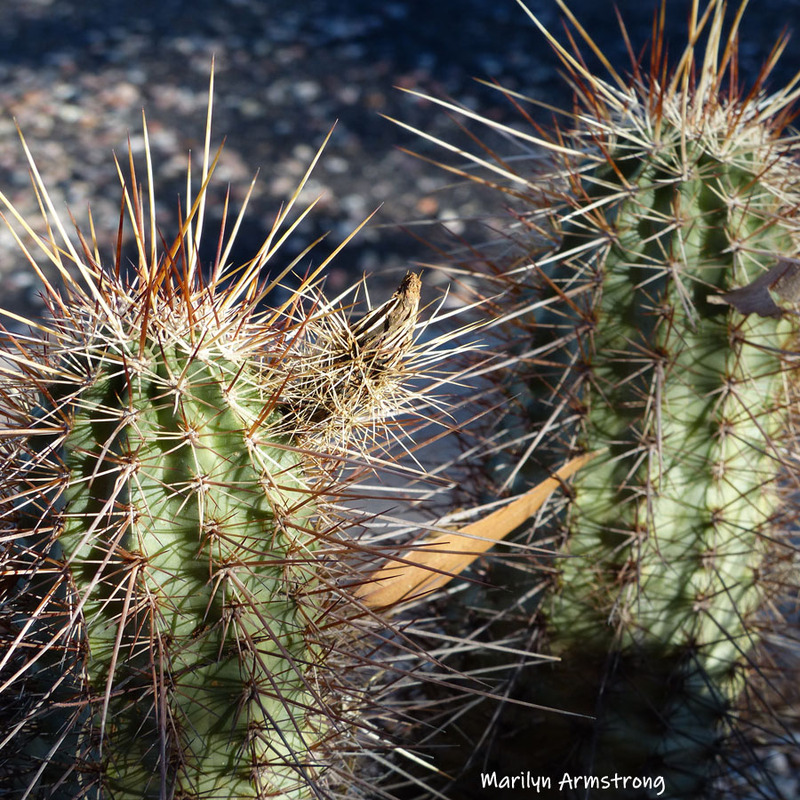 Jagged, barbed, bristly, serrated, prickly, spiny, and pointy things and that’s certainly one of them. I had to get way too close for that shot! Those cactus reach out and grab you and don’t like letting go! I got some pretty “spiky” stuff in my front yard, out here in the desert. No casual strolling recommended. You must watch where you’re going and especially where you are placing your feet. It’s the first yard I ever had that actually threatened me with anything more that the occasional poison ivy. This yard will impale you if one isn’t careful. Some plants will throw little barbs if you get too close…, but it’s beautiful in its own way. Took me all of the 38 years I’ve lived here to get use to and appreciate it. I love it, but you’re right, You have to be very CAREFUL or it will try to eat you! 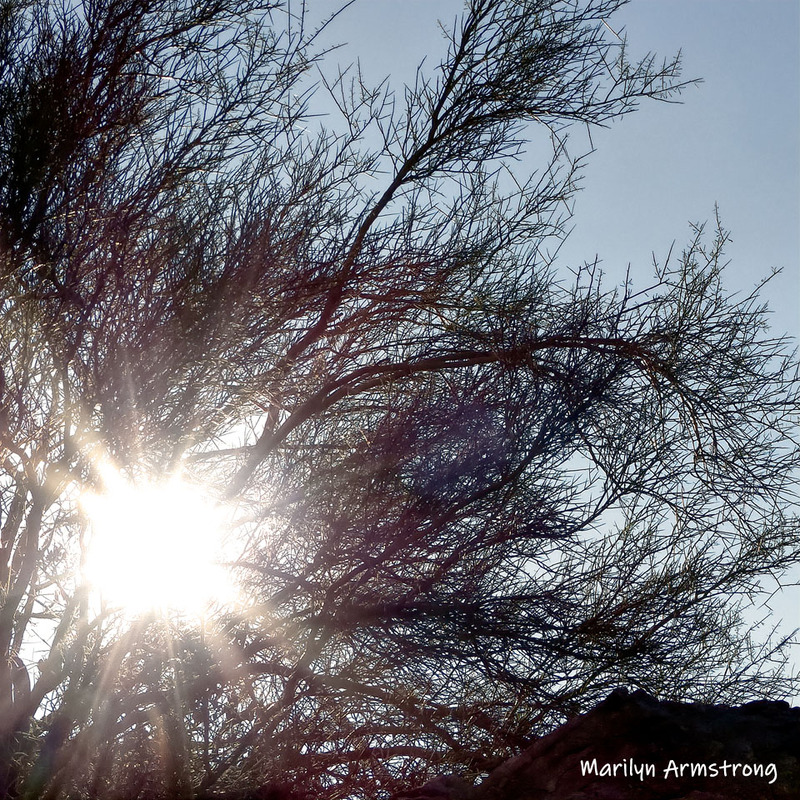 There is ONLY one tree in the Sonoran Desert and that’s the Ironwood. Nothing else can handle the lack of water and intense heat. Whatever you see growing there that isn’t a cactus? It’s Ironwood. These trees form the most amazing shapes and they are the only wood that sinks like a rock. Ain’t nothin’ tougher than Ironwood! perfect sun shot and love the Cacti! One of the amazing things about the southwest is the sun. It’s always aiming at you from somewhere! Unlike here, where it’s a hazy brightness under a big gray cloud! They look like quite the weapon….